On Sunday night, New England Patriots tight end Rob Gronkowski formally announced over Instagram that he will be retiring from the NFL after nine professional seasons. 521 catches for 7,861 yards with 79 touchdowns during his time in Foxborough. multiple back surgeries, a twice-broken arm and a torn ACL. Despite the injuries, Gronk put together a career that all but assures him a place in Canton, Ohio at the Pro Football Hall of Fame. Check out all the best reactions from social media to the news below. Congrats @RobGronkowski on a incredible career brotha! BEAST MODE!!! The best to ever do it. Congrats on a great career brotha and enjoy the next chapter! That’ll do @gronk that’ll do. Honored to go to work with you every single day. Love ya brother. Roger Murtaugh: Guess what? Martin Riggs: What? Roger Murtaugh: I don't want to work with you! Martin Riggs: Hey, don't. Roger Murtaugh: Ain't got no choice! Looks like we both been f*cked! Martin Riggs: Terrific. Roger Murtaugh: God hates me. That's what it is. Martin Riggs: Hate him back; it works for me. *Roger Murtaugh: Have you ever met anybody you didn't kill? Martin Riggs: I haven't killed you yet. *Martin Riggs: Every single day I wake up and think of a reason not to do it. Every single day. And you know why I don't do it? This is going to make you laugh. You know why I don't do it? The job. Doing the job. Now that's the reason. *Roger Murtaugh: I'm too old for this… enjoy retirement @gronk it was incredible… everything. Congrats on an incredible career @RobGronkowski. One of the best to ever do it. Best wishes on whatever comes next! 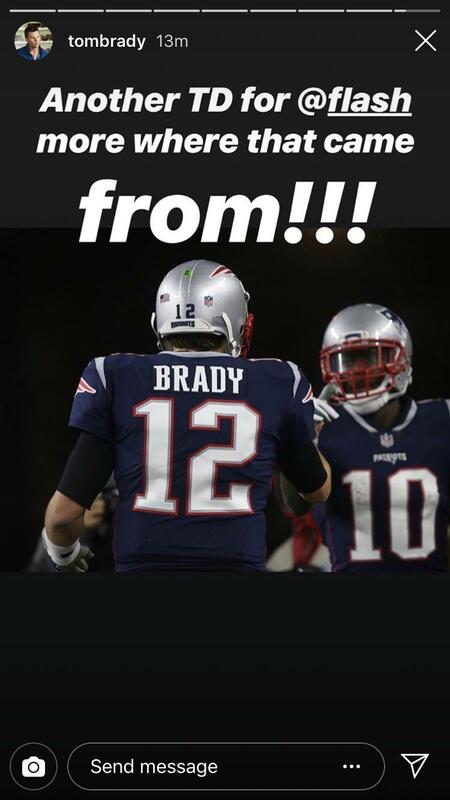 This entry was posted in 2019 Patriots offseason, Patriots News, Patriots Photos, Patriots Twitter, Patriots Video and tagged Brandin Cooks, Brandon Bolden, Bruce Irvin, Chris Hogan, Chris Long, Danny Amendola, Danny Shelton, Deion Branch, Devin McCourty, Duron Harmon, Emmanuel Sanders, Eric Rowe, Greg Olsen, James Develin, James White, JC Jackson, JJ Watt, Kyle Van Noy, Le'Veon Bell, LeGarrette Blount, Logan Ryan, Martellus Bennett, Patrick Chung, Rex Burkhead, Rob Gronkowski, Rob Ninkovich, Sebastian Vollmer, Sony Michel, Tedy Bruschi, Tom Brady on March 25, 2019 by Robert Alvarez. 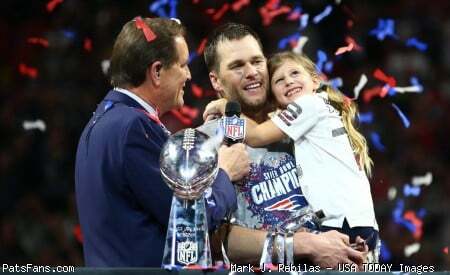 On Tuesday the New England Patriots concluded their Super Bowl celebrations with a championship parade through the streets of Boston. For the twelfth time since 2001, the 2018 New England Patriots became the latest Boston “Big Four” sports team to be honored with a duck boat rolling rally. 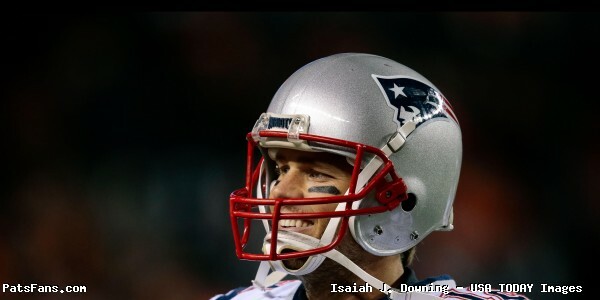 Check out all of the best social media postings from the Patriots, media, and fans below. Robert Kraft is wearing a shiny necklace with the word “Championships”. @LevanReid reports that it was gifted to him by Meek Mill. Gotta say that parade was super live!!! An ambulance stuck in the mud during a Super Bowl parade is no match for Boston. This entry was posted in 2018 Patriots playoffs, Patriots Photos, Patriots Twitter, Patriots Video, Super Bowl LIII and tagged Adrian Clayborn, Bill Belichick, Brandon King, Braxton Berrios, Brian Hoyer, Chris Hogan, Cordarrelle Patterson, David Andrews, Deatrich Wise, Dont'a Hightower, Duke Dawson, Duron Harmon, Ja'Whaun Bentley, James Develin, James White, Jonathan Jones, Julian Edelman, Kyle Van Noy, Nate Ebner, Phillip Dorsett, Rob Gronkowski, Shaq Mason, Sony Michel, Stephon Gilmore, Tom Brady on February 8, 2019 by Robert Alvarez. The New England Patriots entered the AFC Divisional Playoffs against he Los Angeles Chargers seeking to continue their long standing success against the franchise under quarterback Tom Brady. With a win, Brady would move to 8-0 lifetime against the Phillip Rivers led Chargers and advance to the AFC Championship game for the eighth consecutive season. A moment of silence for Makenna Mebane. In the first quarter, the Patriots got the ball first and immediately got to work with the running back corps. A one-yard run by Sony Michel put the Patriots up 7-0 early after an impressive seven minute drive. However the Chargers would respond quick after this breakdown by the Patriots secondary. Seven all thanks to a 43 yard pass from Philip Rivers to Keenan Allen. It would be the last mistake Gilmore would make all game. #Chargers QB Philip Rivers targeting #Patriots CB Stephon Gilmore after the 43-yard TD to Keenan Allen early: 0-5, INT, PBU, 0.0 passer rating. In the second quarter, the Patriots began to pull as Brady found Phillip Dorsett for a 21-7 lead. A career high 40 yard run by Michel setup the Patriots fourth touchdown of the half. A 28-7 Patriots lead midway through the second. The Patriots are treating the Chargers the way the Chargers treated the city of San Diego. 28-7 in the second quarter. Four drives. Four touchdowns for the #Patriots. Never been done in Pats history. Ever been done in #NFL playoff history? The Patriots are the 1st team with a TD on each of their first 4 drives of a postseason game since the Colts did it to the Broncos in the 2003 Wild Card game. No team since 2001 has scored a TD on each of their first 5 drives of a postseason game. This is the second-most points the Patriots have ever scored in the first half of a playoff game. They had 35 in 2011 playoffs vs. Tim Tebow. After four scoring drives to open the game, the Chargers defense finally forced a punt, only to immediately give it back to the Patriots. Who else but Sony? The running back would cash in on the turnover for his third touchdown of the half an unprecedented 35-7 Patriots halftime lead. The 35 first half points tied a franchise record set in the 2011 divisional round against the Tim Tebow Denver Broncos. Press-box announcement: Sony Michel's 3 rushing TDs marks just the fourth time in Patriots history that a running back has had 3 or more rushing TDs in a game. Michel joins LeGarrette Blount (twice) and Curtis Martin (1). The 35 points in the first half tie the Patriots franchise playoff record for points in first half and are tied for sixth overall (reg or postseason. While the Patriots defense continued to keep the Charger offense off the field, Brady continued to attack their defense. According to the NFL, that incompletion to Chris Hogan was Tom Brady's 1500th career postseason pass attempt, extending his own NFL record. Philip Rivers’ favorite receiver today has been Patriots Bench. James White is the first player in postseason history with at least 12 receptions in multiple games (also in Super Bowl LI). A Stephen Gostkowski 38 yard field goal pushed the lead to 38-7. A Melvin Gordon touchdown gave the Chargers their second touchdown of the game to make it 38-14 Patriots after three. According to the NFL, after that 4yd pass to Chris Hogan, Tom Brady just set the record for consecutive postseason passes without an interception. He now has 227 and counting, eclipsing Drew Brees' mark of 226. A Stephen Gostkowski 30 yard field goal made it 41-14 Patriots to open the fourth quarter. With the Patriots leading by 27, Gillette Stadium broke out in song led by Jon Bon Jovi. It's 41-14. There's 11:47 left in the game. The Chargers just punted. It's 20 degrees out. Tom Brady made Brian Hoyer play catch with him on the sideline before joining the huddle. Tom Brady loves playing football. Phillip Rivers found Virgil Green for six and converted a two point attempt to make it 41-22 with seven minutes to go. James White now has 15 receptions, which is a new career high for him and ties Darren Sproles' single-game postseason record. Darren Sproles set the single-game playoff record with 15 receptions on Jan. 14, 2012. James White, who stood in second for his 14 in Super Bowl LI, has now tied him. Kellen Winslow Sr., Thurman Thomas, Shannon Sharpe, Chad Morton, T.Y. Hilton and Demaryius Thomas reached 13. Stephon Gilmore hasn't allowed a catch on three targets since Allen's 43-yard TD in the first quarter. With the Chargers still trailing by multiple scores, Rivers found his old tight end Antonio Gates for an eight yard touchdown in what may be his final NFL game. The Chargers failed to convert a two-point attempt as the Patriots took over to put the game away on a few kneel downs. 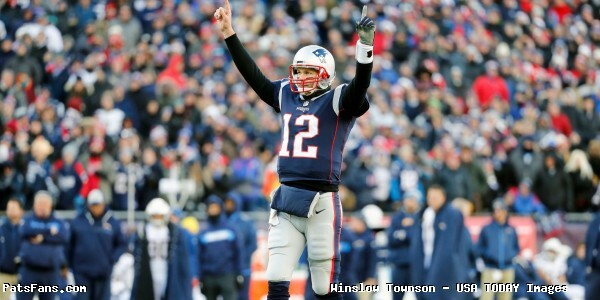 Tom Brady has more playoff wins (28) than Peyton Manning (14) and Brett Favre (13) combined (CC). (1/1). The last AFC Championship Game to not involve the #Patriots was the Jets at Steelers in the 2010 season. The New England Patriots advance to their eighth consecutive AFC Championship game in Kansas City against the Chiefs next Sunday night. Playoff time is @SweetFeet_White time. Let’s go! On to KC. 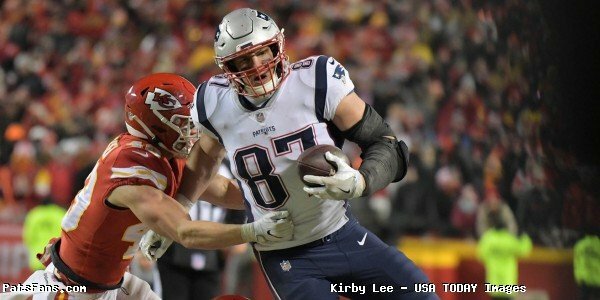 This entry was posted in 2018 Patriots playoffs, Patriots Photos, Patriots Twitter, Patriots Video and tagged Chris Hogan, David Andrews, Dont'a Hightower, Elandon Roberts, James Develin, James White, Julian Edelman, Rex Burkhead, Stephon Gilmore, Tom Brady, Trey Flowers on January 15, 2019 by Robert Alvarez. James Develin’s 2018 season just got a bit more special. On his Instagram account Wednesday, Develin shared news that his wife was to be expecting their third child. Adding another member to this crew in a few short hours. The strength and selflessness I’ve seen in @jennydevelin these past few years has been incredible. Can’t even begin to tell how proud and appreciative I am for all you’ve done for us. We absolutely adore you. NOW LETS GO HAVE THIS BABY!! As a result of the impending pregnancy, Develin missed practice on Wednesday to be with his family. 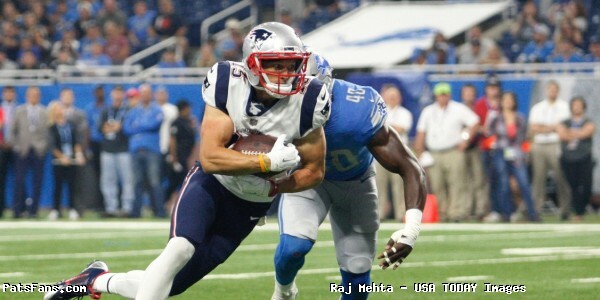 It is the third time this season a Patriot has had to leave the team due to paternal matters, Rex Burkhead was late to practice in November for the birth of his son and Trey Flowers missed practice in December for the birth of his daughter. Develin finished the 2018 season with a career highs in receptions (12) and rushing touchdowns (4). Congratulations to James and Jenny! 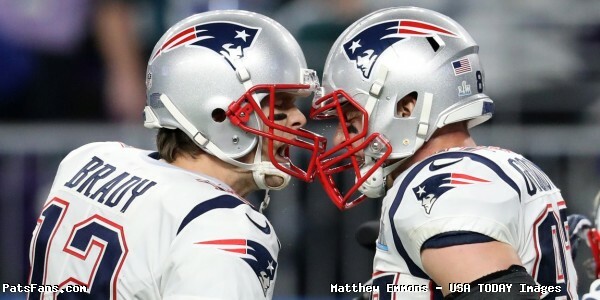 This entry was posted in Patriots Commentary, Patriots Photos and tagged James Develin, Rex Burkhead, Trey Flowers on January 2, 2019 by Robert Alvarez. The New England Patriots entered their Week 13 matchup with the Minnesota Vikings looking to keep pace with the Kansas City Chiefs for the top seed in the AFC Playoffs and continue their December dominance into another season. The Patriots came in at 8-3, while the Vikings, who continue to battle for an NFC Wild Card spot, were 6-4-1. In the first quarter, the Patriots struck first from an unlikely source, fullback James Develin carrying the ball in from the one for a 7-0 lead. Coming into the season, Patriots FB James Develin had 1 touchdown in his 5-year career. With his 1-yard score on the Patriots opening drive, Develin now has 2 TD in his last 3 games. Another week, another new Tom Brady milestone, and this one was a long time coming. A Brady five yard gain to put the quarterback over 1,000 rushing yards for his career. It took Tom Brady only 18 seasons and 12 games to reach 1,000 rushing yards. In his 19th season, Tom Brady has finally reached 1,000 career rushing yards! 4,582 = number of additional games Tom Brady would need to pass Emmitt Smith as the #NFL's all-time leading rusher, at his current pace. On Tom Brady/1,000 rushing yards, @ESPNStatsInfo has tracked "kneels" since 2006. And since 2006, Brady has lost 160 yards due to kneels. The score remained 7-0 Patriots after a quarter as kicker Stephen Gostkowski added to the lead with a 20 yard field goal to extend it to 10-0 midway through the second. Despite the Patriots having full control of the game and time of possession, the offense struggled to pull away and the Vikings got back in the game with an Adam Thielen touchdown reception. 10-7 Patriots at halftime. The score was made possible by a gutsy third down challenge call by Vikings head coach Mike Zimmer. Zimmer's challenge worked out for him. Patriots stopped on third down, and the Vikings will have the ball with 2 minutes remaining in the half. In the third quarter, former Viking Cordarrelle Patterson tormented his former team with a big gain. Unfortunately the Patriots offense continued to scuffle as the Vikings would tie the game at 10 with a Dan Bailey 39 yard Field Goal. Needing to grab back momentum, Josh “Flash” Gordon came up big. Such a huge fan of the Josh Gordon comeback campaign. 17-10 Patriots after three quarters. Leading by seven into the fourth, the Patriots defense continued to dominate the Kirk Cousins offense. With 11 minutes to go in the game, the Patriots offense padded their lead when James Develin again scored to push the separation to 24-10. 3 carries, 3 touchdowns this season. Of all of Belichick’s oddities and habits, nothing beats him keeping his challenge flag in his sock. Adam Thielen (yelling in referee's direction, close to Bill Belichick, after Belichick threw challenge flag but had extra time ase Patrick Chung was injured): "That's bull—"
Bill Belichick (looking in Thielen's direction): "Shut the f— up." Under five to play, the Patriots defense forced two big turnovers to end the Vikings night and a 24-10 victory. WHERE: In the end zone. Duron Harmon's interception is his 11th in the fourth quarter since 2013 (includes playoffs), which ties Richard Sherman for most in NFL during that span. By beating the Vikings, the Patriots extended their own NFL record for most consecutive winning seasons to 18 straight (2001-2018), the team also moved to 9-3 through 12 games, for the 13th time under Bill Belichick and the eighth-straight year that the team has started the season with a 9-3 or better record. Seven of those 13 times, the team has advanced to the Super Bowl. The Patriots will travel south to take on the 6-6 Miami Dolphins at 1:00 next Sunday. Shout out from the multi-TD scoring fullback, @jdevelin! The #Patriots defense hasn't allowed a 300-yard passer in five games. They haven't allowed a 100-yard rusher in NINE games. This entry was posted in Patriots Photos, Patriots Twitter, Patriots Video and tagged Ben Coates, Cordarrelle Patterson, Duron Harmon, James Develin, James White, Jonathan Jones, josh gordon, Julian Edelman, Martellus Bennett, Rob Gronkowski, Stephen Gostkowski, Stephon Gilmore, Tedy Bruschi, Tom Brady, Trey Flowers on December 4, 2018 by Robert Alvarez. On Tuesday night, the NFL officially announced its Pro Bowl rosters for the game at Camping World Stadium in Orlando, FL on January 28th 2018, the week before the Super Bowl. Four Patriots were selected as part of the voting process, Quarterback Tom Brady, Fullback James Develin, Tight End Rob Gronkowski and Wide Reciever/Special Teams Matthew Slater were all selected to represent the Patriots. The Patriots have now had at least four players selected to the Pro Bowl in each of the last nine seasons. Brady’s 13th Pro Bowl selection in 18 seasons continues a team record, including nine consecutive beginning in 2009. He has now passed Guard and Pro Football Hall of Famer John Hannah (1978-85) for most consecutive Pro Bowl selections in franchise history. Brady heads into Week 16 leading the NFL in completions (346) and passing yards (4,163), and he is third in touchdown passes (28). While the selections come as an honor and even money bonuses for some players, because the Pro Bowl will be played the week before the Super Bowl again, should the Patriots make it, none will participate in Orlando. It is always an honor to be selected to the pro bowl. Congrats to my other teammates and thanks fans!!! This entry was posted in Patriots News and tagged James Develin, Matthew Slater, Pro Bowl Roster, Rob Gronkowski, Tom Brady on December 20, 2017 by Robert Alvarez. 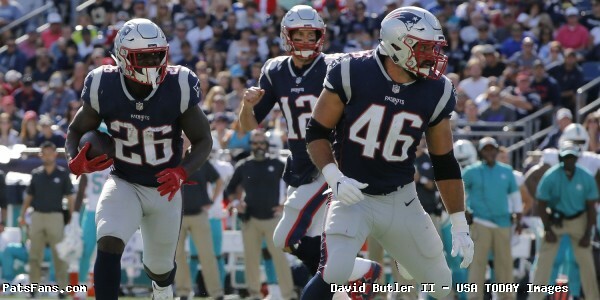 A member of the New England Patriots for six seasons, fullback James Develin doesn’t often get the attention of the cameras or the stat sheet, but has become a valuable blocker for the running backs that have passed through Foxboro during his tenure. Once in awhile, he sneaks in a pass or two like he did against the Carolina Panthers two weeks ago. For his career, Develin may only have one touchdown pass to just 16 total receptions, but one Patriots fan wanted to give him a tribute video for all of his hard work that may go unnoticed to the casual observer. YouTube user Von Wolfwood put together the following highlight reel of Develin’s time in New England since he first arrived in 2012, a career that has seen his teams play in the AFC Championship at minimum, every season. This entry was posted in Patriots Commentary, Patriots Video and tagged James Develin on October 11, 2017 by Robert Alvarez. We’ll be doing profiles on each of the free agents in the upcoming days and give you our take on whether they return or move on. 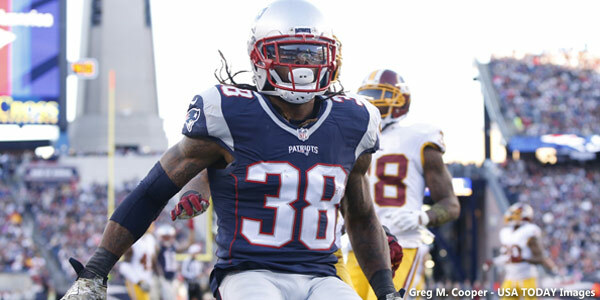 One of the players facing free agency is the reserve running back Brandon Bolden. The Patriots signed the running back as an UDFA from Mississippi in 2012 and Bolden the 5’11, 220-pound running back has been a fixture of the Patriots special teams ever since. But the Patriots need some depth at the position with Bolden, LeGarrette Blount, and James Develin all free agents this season. They also have two backs (James White and Dion Lewis) in the final year of their contracts. Bolden’s roster spot has always been tied to his being a core special teamer who could contribute when needed on offense. With the overall health of the backs better this season he had the least production of any year of his career in 2016 with just one carry for four yards and two receptions for 15 yards. The 27-year old, however, is always prepared to enter a game when needed and play some important snaps on offense when his number is called. That’s why he remains a trusted teammate and player on the 53-man roster. 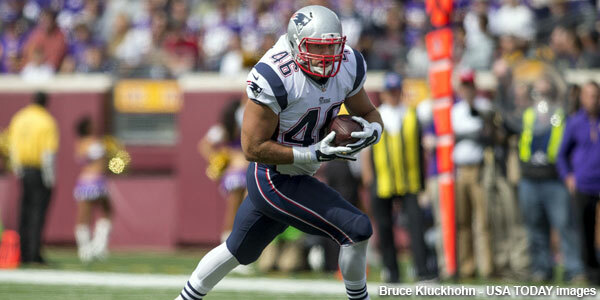 Why Bolden Will Return: The Patriots have always valued Bolden and his versatility. He’s a good runner that can show power, a good pass receiver out of the backfield as well as a core special teams player that plays on all four units in the kicking game. 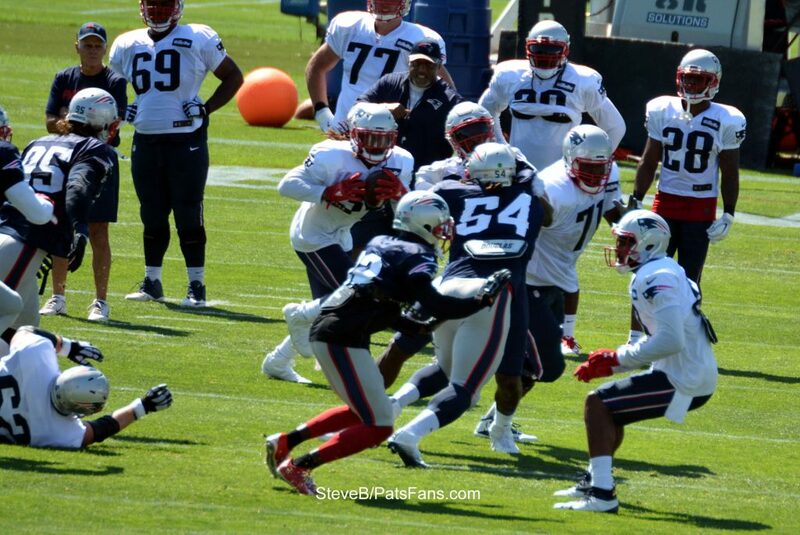 Bolden’s versatility to fulfill multiple roles is a reason he’s always active on the 46-man game day roster. He frees up the coaches to use another player elsewhere. 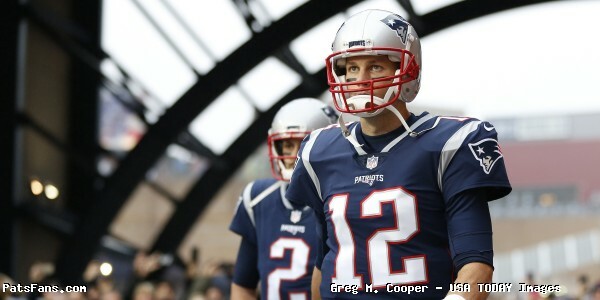 The Patriots know his usefulness and should be able to re-sign him easily back to the team without breaking the bank. He’s still young at 27 with very little tread wear on his tires and could be counted upon to continue his role for the next couple of seasons. Bill Belichick has always valued his special teams’ performers and Bolden is one of the standout every season. He logged special teams tackles in the divisional playoff win over Houston and the Super Bowl victory over Atlanta. Why Bolden Won’t Return: There is a chance that the Patriots will want to upgrade and get younger at the running back position overall in 2017. This year’s draft class is deep and there will be a number of prospects both early and in the middle rounds that could be of interest to the team. ESPN’s Mike Reiss pointed to Rams’ RB Benny Cunningham may be on the Patriots radar again as a free agent. As a restricted free agent last year, he took a visit to New England. Like Bolden, he’s a core special teamer with good return ability and at 26, is a bit younger. He’s also an upgrade offensively as he’s a bit better as a runner and much more productive as a receiver. Bottom Line: The Patriots and Belichick have always valued Bolden’s STs ability and his versatility. He’s been a key ST’s member of two Super Bowl winning teams and comes from a football background. His grandfather played in two SBs with the Chiefs, winning SB IV over the Vikings. His versatility and the low cost of retaining his services make Bolden an attractive target to re-sign this spring. There will be little demand for his services as a Special Teams’ performer although there may be a team that really needs a boost in that department and would be willing to pay. Houston with former Pats STs standout Larry Izzo as their STs coach could be a destination. Especially with their dreadful showing in the playoffs. With a deep crop of running backs in the draft, look for the Patriots to either pick one or two up with their picks or signing one as an UDFA in an attempt to get deeper and younger. Bolden’s chances of returning a bit better than 50/50 in 2017 but he should see some competition this spring and summer. This entry was posted in 2017 Free Agency, Patriots Commentary and tagged 2016 NFL Season, 2016 Patriots season, 2017 free agency, 2017 Patriots free agents, Bill Belichick, Brandon Bolden, D.J. Foster, Dion Lewis, James Develin, James White, LaGarrette Blount, New England Patriots, NFL, Patriots, Patriots running backs on February 28, 2017 by Steve Balestrieri.